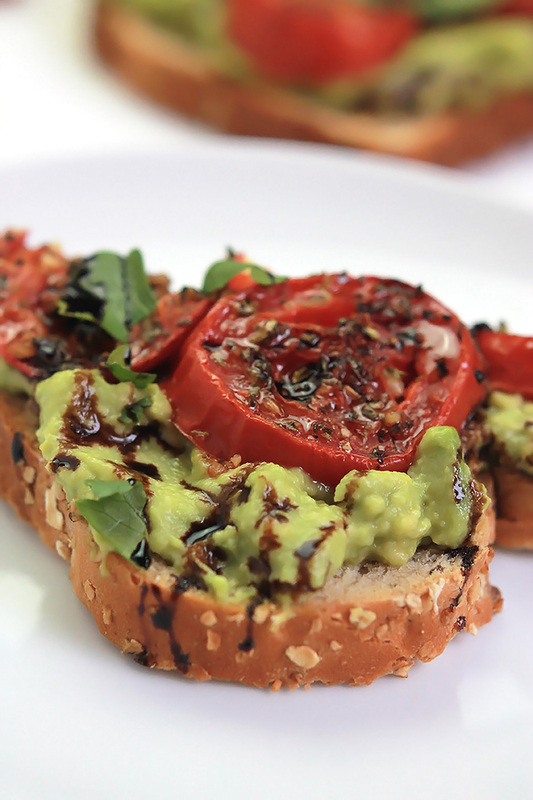 Simple, easy and delicious – Roasted Tomato Avocado Toast. Creamy Avocado mash, sweet roasted tomatoes, drizzled with balsamic glaze, it takes toast to a whole new level. Can you believe I have never had avocado toast? Yeah, never. Well, I put an end to that nonsense with this Roasted Tomato Avocado Toast. How crazy is it that something so simple and easy is so delicious,with healthy fat, and I have never tried it! I think because toast is typically served for breakfast, most of the recipes I’ve seen have been for breakfast. But breakfast doesn’t have the exclusive, have it whenever you want, breakfast, lunch or dinner. I had this deliciousness for a late afternoon snack. I started by slicing and roasting some roma tomatoes 15 to 20 minutes. 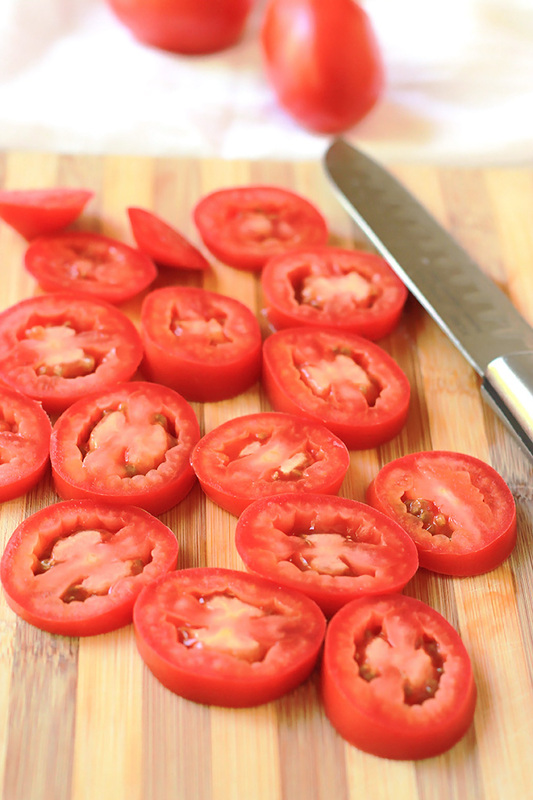 If you’re in a hurry, you can totally skip this step and just use fresh sliced tomatoes. But there is something about a perfectly seasoned roasted tomato that oozes goodness. Something I have to share about the browing of the avocados, it’s beat to use lime instead of lemon to slow the oxidation. When I use lime juice the avocado stay nice and green, whereas with the lemon it starts to oxidize after a few hours. I’m not sure why, but it works for me. Drizzle with balsamic glaze and garnish with flat leaf parsley and red pepper flakes before serving. Oh my gosh this is so delicious!!! I’m not sure who started this delicious trend, but I’m glad they did and I’m glad I finally gave it a try. Pre-het oven to 375 degrees and line a shallow pan with parchment paper. Slice tomatoes and place on baking pan. Sprinkle with the italian seasoning, sea salt and drizzle with a bit of olive oil. Roast the tomatoes 15 to 20 minutes. While the tomatoes are roasting, cut avocados in half, remove pit, and scoop the flesh into a medium bowl. 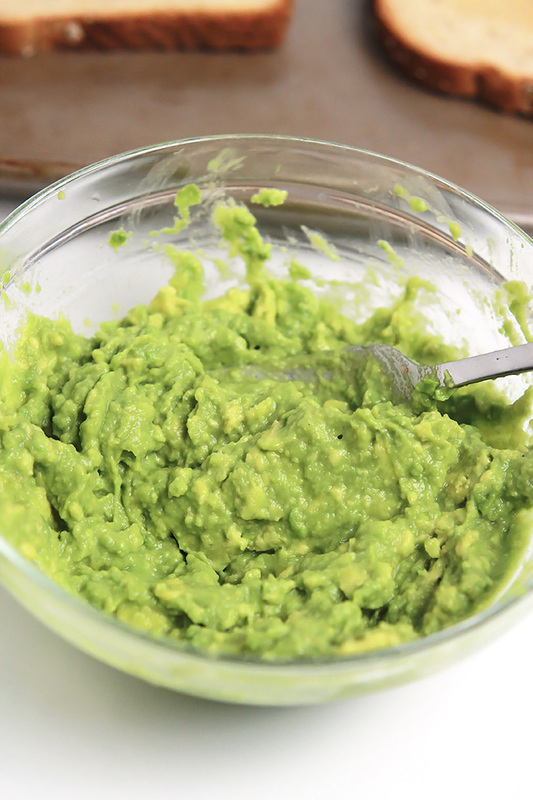 Add the lime juice and mash the avocados with the back of a fork until the desired texture is reached. 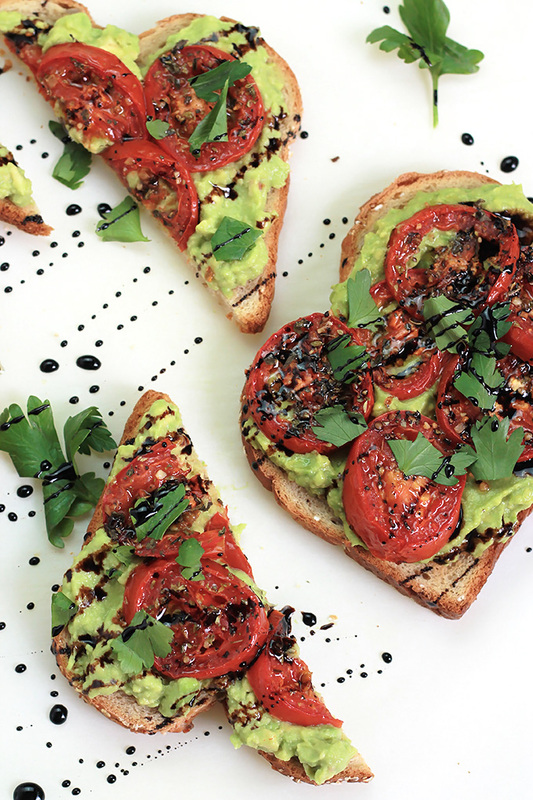 Spread the avocado mash over the toast, place slices of tomato over the avocado mash, drizzle with balsamic glaze and garnish with flat leaf parsley and red pepper flakes. If you make this recipe or a version of it, take a picture and share with me on Instagram, tag it #thewholeserving or leave a comment below. 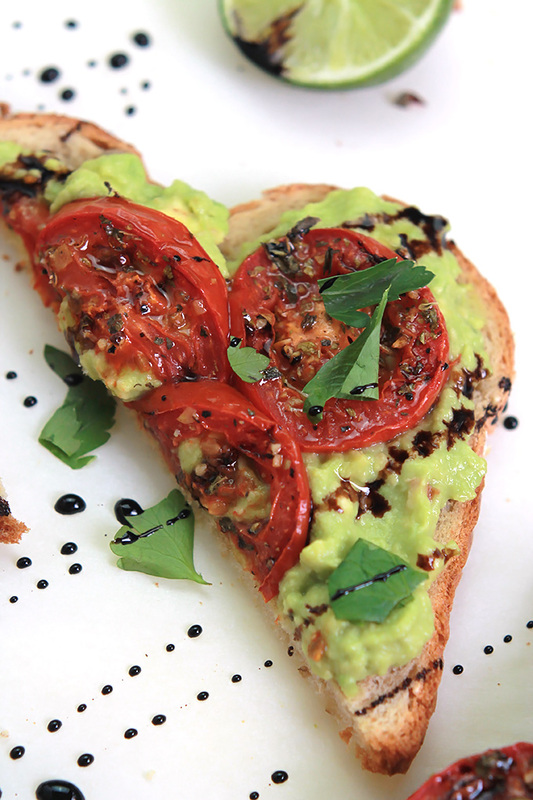 I’d love to see or hear about your version of this Roasted Tomato Avocado Toast. This looks really good! I will have to try it. Thanks Anna, I hope you have a chance to give it a try soon and I hope you like it as much as I do. 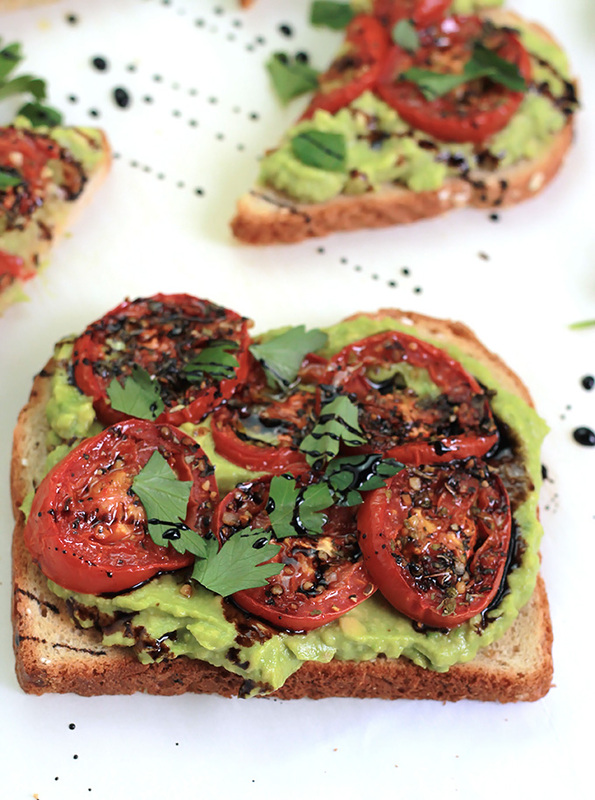 I LOVE avocado toast, but never really venture out of the avocado/bread combo – love this roasted tomato version! I’m a new avocado toast lover, can’t believe I hadn’t tried it before making this. Thanks for stopping by Morgan and enjoy! Well I know what I’m having for brunch today! I got an abundance of roma tomatoes and avocados in this weeks organic produce box! In the past I’ve also had avocado toast with some canned salmon on it too-divine. Hi Jodi, That sounds great, where do you get your produce box from? Is it delivered to you? I would love to have fresh produce delivered to my door. Here in South Florida (and some parts of Northern Florida) we have a company called http://www.anniesbuyingclub.com that delivers organic produce to a local coordinator who then divides it up into “shares” or boxes and everybody in the group picks up their share at the designated pick up location once a week. Thanks Charlene, I just checked out your party and linked up tow of my post. I look forward to visiting some of the other links. Yeah, I can’t believe it myself, but now that I have I’m hooked and I have to come up with other ways to enjoy this wonderful thing. Classic and delish! Love the addition of the balsamic and red pepper flakes, brings out a whole new dimension! Yes it does. I could put balsamic on just ablot anything. Thank you Mary for visiting, have a great week. This looks delicious! I think it would make a nice afternoon snack or even a light lunch. Yum. I’ve had it quite often as a late afternoon snack. Super satisfying. Thanks Krista for stopping by. This looks yummy, Celeste. I have pinned already as both breakfast and sandwich recipes. I am definitely going to try it! I have connected with you on Google+! Thanks Lynn, I’m glad you like it and thanks for sharing. Hi Rebecca, Thanks for visiting and enjoy! This looks incredible! I just got a bunch of avocados, I will be trying this soon. And your photos are amazing! Making me hungry 🙂 Thanks for sharing at Titus 2 Tuesday! Thanks Stefani, this is a great way to use those avocados.Enjoy! I adore avocado, but have never had avocado toast! I have one avocado sitting on my kitchen counter, so I will have to make this! 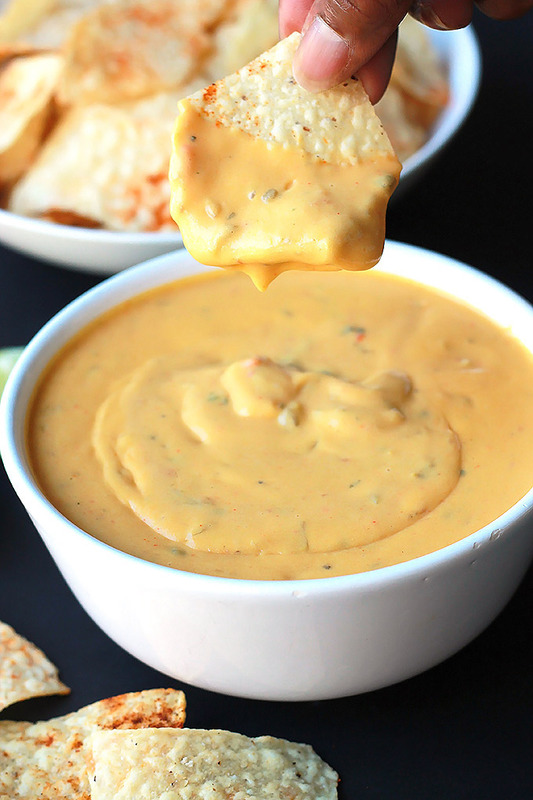 Thanks for sharing this recipe at Craft Frenzy Friday on Mom Home Guide! So I’m not the only one. I hope you enjoy as much as I do. Yummo! I am going to have to share this with my friend who LOVES all things avocado. If your friend likes avocados, they are going to love this, it’s so delicious. 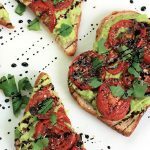 I’m a new avocado addict and love it mashed on toast with tomatoes but until I saw your link at Tutorials & Tips, I never thought to have balsamic glaze on it – another favourite! Can’t wait to try that tomorrow. Thanks! Hi Lori, I hope you like it as much as I do. This has become one of my favorite afternoon snacks. This looks beyond delicious! I will definitely try this recipe soon, so I’m pinning it. I love tomatoes. Thank you and I hope you enjoy as much as I do. Hi Robbi, It was absolutely delicious. I hope you enjoy as much as I do. Thanks for sharing and visiting. I am so excited about these! I am always looking for something quick and easy but yet tasty and yummy! I can’t wait to try these! Thanks so much for sharing at family Joy Blog Link Up! That’s what nice about this, it’s so quick and easy, I can make on a whim and have to wait forever to enjoy. Glad you like it Erin, enjoy! For someone who never had avocado toast, you started out with a bang! This looks delicious, and I might have to make it for lunch today. 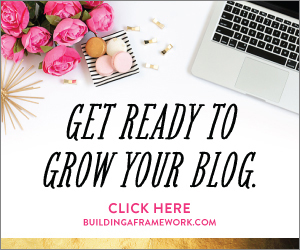 Visiting you from the Wine’d Down Wednesday linkup! Yeah, I can’t believe I waited so long. I’ve been working on other ways to enjoy avocado toast. This looks amazing. Can you believe I am in the “never had avocado toast category” too ? I don’t know why. I’ve been seeing it everywhere. I will definitely try this Looks great and what a gorgeous site you have! Thanks Krysten, Beware after you try this toast you may just be hooked on the stuff. I am and now I’m coming up with more ways to enjoy the yummy stuff. Thank u! You too! I should tell you I tried it today and on sprouted grain bagel and it was delish! Wow, Celeste! This looks so good and I can’t wait to try it. Thanks for sharing your recipe at the Over the Moon Link Party. Thanks Sandy, have a wonderful Mother’s Day weekend. Thanks for stopping by Robyn. This toast is pretty amazing, I glad I finally decided to give Avocado toast a try. I hope you are having a wonderful Mother’s Day weekend. This looks so fresh and colorful! Your skills in the kitchen paired with your photography skills have me salivating! I love all these flavors, avocado, tomato, and balsamic. But never thought about pairing them together! Pinned and stumbled, I will not lose this recipe!!! Especially when the garden tomatoes are coming in, this will be incredible! Oh I wish I had a green thumb, I would love to have my own garden filled with fresh fruits and veggies. I look forward to seeing your bounty. Celeste, this looks so yummy and healthy! I will be making this asap! Thanks Carol, have fun with this one. I found myself eating it as my afternoon snack some days. This looks very delicious, I will try it for sure…. Thanks, I’m glad you like it. It’s super easy to make.